It’s time to return again to our regularly scheduled Jules Verne programming. It doesn’t look like I will make my original writing goal for this weekend, but I will hopefully get to 10,000 words by the end of the month, so I will keep posting things after my tribute to Verne is over. Voyage au centre de la Terre is the third Verne novel I have read, and so far it is my favorite. There are multiple translations and the names of the main characters are different depending on which one you read. I read the version where the narrator is called “Harry Lawson” rather than Axel Lidenbrock. According to Project Gutenberg, this 1871 translation is the one that is most widely circulated, but it is also not as true to the original text as the 1877 version. Apparently what I read was somewhat abridged, but was still about 470 pages. So here’s a very brief synopsis: Harry starts his story by setting the scene of his life with his eccentric uncle, whom is most often referred to as “the professor.” But the story really gets going when the professor discovers a coded message scrawled in an antique text he has just purchased. The former owner was a 16th century alchemist named Saknussem who left behind directions to the finding the exact center of the Earth. The enthusiastic professor drags the reluctant Harry along for the ride to Iceland, where Saknussem’s tunnel is located. With the help of a taciturn Icelandic hunter, they embark on an incredible journey of discovery into the depths beneath our feet. Along the way they encounter living fossils from bygone ages, a huge subterranean sea and a multitude of other wonders. There were two main reasons that I liked this book more than 20,000 Leagues Under the Sea and Around the World in 80 Days. First, the first-person narration by Harry was often very humorous, especially when it came to his own misgivings and cowardice. Second, this story was not bogged down by minutiae. There were only a few Latin names dropped in here and there, and because Verne was pulling this place out of his imagination rather than reporting on a real locations, it freed him to be able to drive the action any way he pleased. It would be nice to read a version that has gone through a modern editing process to get rid of the redundancies that so often occur in these old serials. For instance, the phrase “my uncle, the professor” occurs several times, and the Icelander is referred to as “Hans, our guide” almost without fail, as if there would be some other Hans wandering around hundreds of miles below the Earth’s crust. I am sure it helped readers of the original serial over the course of the year it took to read the whole thing, but it does get to be a bit repetitive when reading it as a novel. The science in this book doesn’t stand the test of time quite as well as others from this period, but for when it was written it was right in the middle of the scholarly debate concerning the origins of life on Earth. In the 1860s, academics had only recently abandoned the straight Biblical interpretation of our origins in light of the discovery of fossil hominids in unexpected strata. There were also distinct schools of thought concerning the nature of the planet itself, the inner workings of which were not fully explained until the theory of plate tectonics was put forth almost a century later. 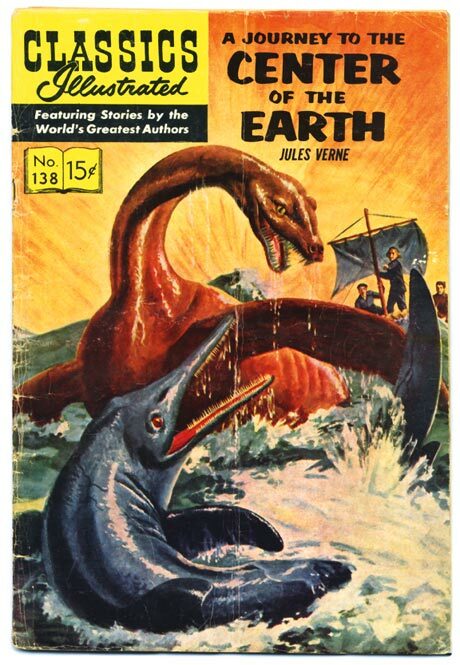 Perhaps this is the reason, not to mention the enormous sets that would be required, that Journey to the Center of the Earth has only rarely been adapted to film and television compared to Verne’s other works. The first film was made in 1959, but it wasn’t remade in English again until the 2008 re-interpretation which put a contemporary uncle (Brendan Fraser) and nephew (Josh Hutcherson) on the path described in Verne’s novel rather than following the narrative as it occurred in 1864. Enjoy reading this review? Check out some of my others! This entry was posted on March 23, 2015 by Phoebe Darqueling. 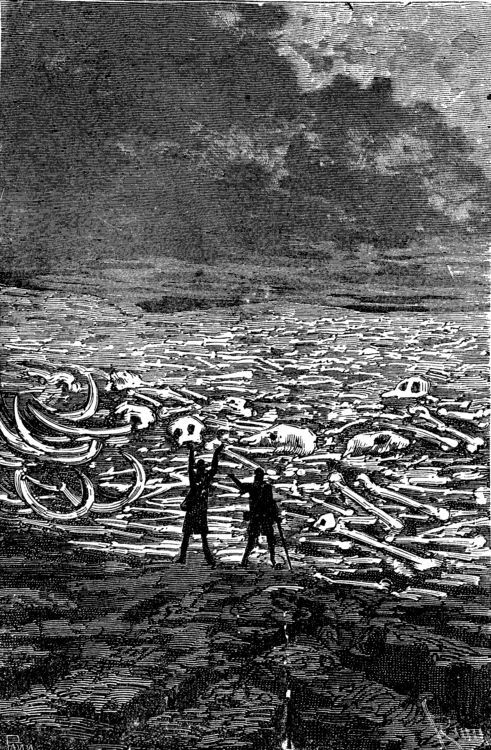 It was filed under Books, Graphic Novels and Adaptations, Entertainment and was tagged with Adventure, Book Reviews, Books, Journey to the Center of the Earth, Jules Verne, Science fiction, steam punk, Steampunk. I’m unclear why you refer to Verne as Steampunk in the title. Yes, modern Steampunk authors often homage Verne as their inspiration and template but he thought he was writing scientific adventure stories. Steampunk is a modern invention…. A pastiché, an hommage, a reverent recreation of the Victorian-esque past through a modern lens. I haven’t gotten around to reading that one yet, but I am sure I will get to it someday! I read a different translation but I enjoyed this book as well. It’s the characters and dialogue that I enjoyed.